October 2016 Medical Update - Adventures with the Tuleys! Hello again! I’ve not completely given up on writing, it’s just not been my top priority lately. Between moving, getting settled, adjusting to the routine of our new middle schooler, additional therapies and preschool schedule, keeping up with homeschooling, along with the daily cooking, cleaning and laundry, it’s been a crazy few months. However, things seem to have settled into a nice routine and life is a bit more calm these days. Giving the growth hormone shots has been drastically better! Josiah will still request no “pen poke,” but complies to laying on the couch for the shot. We’re even able to give the shot on our own, with no one having to hold him down. We’re so thankful he’s adjusted to the new routine of shots every day. Even better, the growth hormone is doing its job! We saw the endocrinologist last week and Josiah has grown about 2 inches since his last visit in June! He jumped from the 0.07 percentile up to the 0.51 percentile in height! He’s gotten so long and skinny, and finally looks like he’s almost 5 years old instead of almost 3! Josiah had botox in his right arm and hand two weeks ago, and is using that side much more with the help botox provides. I hate having to take him every three months, especially since he is sedated for the procedure, but the help it gives him is most certainly worth it. This time, the sedation used was an injection, which Josiah wasn’t too happy about. 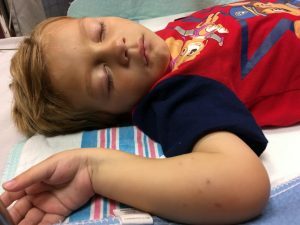 However, it was a quick shot, as opposed to getting an iv placed in his arm – which has not been an easy task the last few hospital visits. Here you can see where some of the botox injections were placed in his arm. Due to Josiah’s growth, he’s outgrown his leg/foot orthotic (brace), and really has enjoyed the time without having a brace. He has been fitted for a new one, and we will pick it up on Thursday. Hopefully he adjusts to wearing one again and doesn’t fight us too much on it. And hopefully I can easily find shoes to go with it again this time! I realized I’ve not ever talked about the information we gained from Josiah’s neuropsychology visit earlier in the summer. Mostly, this visit provided a baseline for future testing. They did discover a need for speech and language therapy. Speech isn’t as much as an issue as language and vocabulary, which has been the focus of therapy. The speech therapist who tested him was shocked when we brought him in for testing, but tested him specifically for the language problems that were recommended. She was even more shocked that Josiah’s results were as low as they were, simply because in everyday conversation, Josiah excels. The difficulty he has is due to the stroke, and therapy has been very helpful in this area. He’s quite the unique case, as the therapist said in 17 years, she’s never seen this in a child, but is usually seen in adults who have suffered a stroke. A quick example of a language issue we’ve seen – In the past we have assumed the reason Josiah has been unable to name colors is because of his vision; not knowing if he has color blindness. 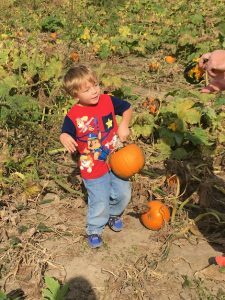 While this still may be an issue, Josiah occasionally has difficulty with “finding words.” So, while he can point to something that is orange, he may not be able to tell us the correct color when asked, and he blurts out the first color that comes to mind. When he’s prompted to slow down and really look at the color, he is starting to answer correctly. Again, therapy has been very helpful, and by knowing what the problem is and how to help him, we’ve seen a lot of improvement over the last few months! Josiah has been going to preschool two mornings a week. He has LOVED it! 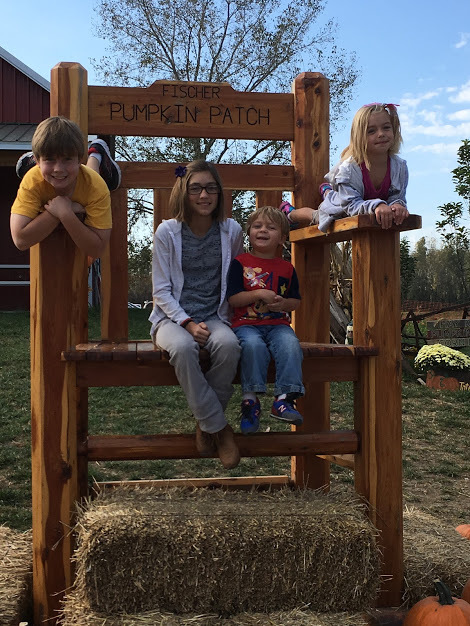 The his class field trip to the pumpkin patch, which our whole family was able to attend, was a lot of fun. He wasn’t ready to leave when it was over. When he comes home from school, he’s pretty happy and we can tell he’s gaining a lot of knowledge by going. We’ve considered adding another morning, but with 6 therapies per week, it’s hard to squeeze anything more in! He still takes naps most days; even if we don’t lay him down for a nap, we’ll find him either on the couch, chair and sometimes the floor asleep on his own! School and therapies wear him out, especially the speech therapy. Six therapies a week takes up quite a bit of our schedule these days. In addition to speech therapy, he’s also continued with occupational therapy and physical therapy. He’s doing great in both, gaining strength in his right leg and learning to utilize his right hand. He is able to pick up a small block with his right hand and place it into a box. He doesn’t much care to do it at home, but enjoys it at therapy. They’re teaching him alternate ways to cause his hand to open and shut by moving his wrist up and down. This is where the botox helps, it causes his wrist to not be so tight, allowing easier movement. Josiah’s 5th birthday is coming up in November and he’s super excited. His birthday list is quite expensive. He would like a bobcat for construction, and “not a toy bobcat, a REAL one!” He’d also like a bulldozer, dump truck, and you know, any other real construction equipment. He also is wanting some drums and drum lessons. 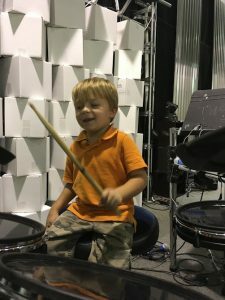 He loves Sundays when I’m on the worship team at church and he can sneak back and play on the drums after our practices! Grace plays violin, and Samuel the guitar, and they have to look at their chords in order to play. He’s constantly telling them that he can’t play the drums because he doesn’t have his chords. He’s got a lot to learn! I think he’s mostly excited to have a cake, have people sing happy birthday to him and blow out the candles. It’s so great to see him so excited about his birthday. The next MRI is December 7th. You two are doing a fantastic job and we are so happy for Josiah. Our prayer is still with you. Thank you for the updates. Wonder just what God has for Josiah to do someday with all the experience he has. Love from Geneseo. Thank you! That means so much to us! Love right back to you!!! Thanks Doris! It’s so nice to have an easy way to be able to keep everyone updated! Thank you for the updates! We love hearing how well he is doing! Love your family and blessings this Thanksgiving Season! You’re welcome! Love to you as well! I heard in class he is going to get drum lessons. I thought he lookes like he was getting taller! He keeps talking about these drum lessons… Guess I better get on that! Lol!